Had a small bbq yesterday with some spicy mackerals. They are very easy to make and tasty. To bbq best use a bbq fish holder to prevent the fish breaking into pieces. If you don't fancy a bbq, the fish can be grilled. Put all the spice paste ingredients into a mini blender and blend till smooth. Score the fish diagonally, quite deep into flesh. Make 2- 3 slits on each side of the fish. Use a serving knife and smear the spice paste inside the fish stomach and within the cuts and some on the skin. Carefully place fish on a bbq fish holder, bbq till nice and brown. *Or if you have banana leaf you can wrap the fish with the leaf, secured with cocktail sticks and put the whole parcel on the bbq till the leaf wilted and charred. 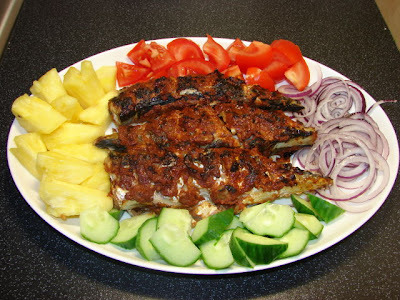 ** Serve fish with plenty of raw red onion, pineapple, cucumber and tomatoes. You can also squeeze lime over the fish. ***This fish can also cooked under the grill.